Following Thai Tradition, the place which has been chosen for the Wai Kru Ceremony should be carefully arranged with Muay Thai Boxing Equipment laid out on each side of the setting. Usually, a statue of the Buddha is placed in a central location as the main focus of attention. White flowers, incense sticks & candles will normally be brought to this place as Ceremonial objects for paying Homage with. him for approx 1 minute duration. The Wai Kru Ceremony proper then begins. All of the trainees should then bend forward & perform 3 prostrations to show respect. They should then resume sitting quietly and still again. Their Teacher will usually at this point in time prepare the 'Holy Water', by certain Rituals such as dripping wax from the candle into it. 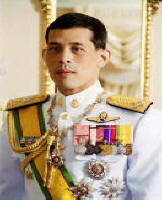 At the same time, he will say prayers in Thai praising all the virtues of the Buddha, Dhamma and Sangha. At this point in time during the Ceremony, all of the lit candles and incense sticks will then be collected and put together in 1 place. After which, all the trainees will usually perform 3 more prostrations towards their Master. Then after kneeling down, sit in the Lotus Position with their hands clasped together at the centre of their chests (palms flat) as in the Traditional 'Wai' position. The Teacher will usually lead the trainees in the chanting of Buddhist prayers. 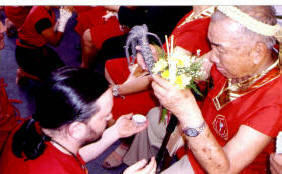 While preparing the Ceremonial "Holy Water" it is not unusual for Teachers to drink some of it, sprinkling some onto the crown of the head. After which, he will then usually dip the index finger of his right hand into the container that holds the scented powder made moist by him and dab it onto all of the Muay Thai training equipment. The teacher will also mark the crown of the Trainees heads with the moist powder while saying (chanting) 'Namo Buddhaya' which means roughly - a blessing from the Buddha. Following Tradition, normally at this point in time the Trainees may take some of the wax from the 'Holy Water' and stick it to their hair. This is meant to be very lucky and is called - 'To attach or or stick the wax'. 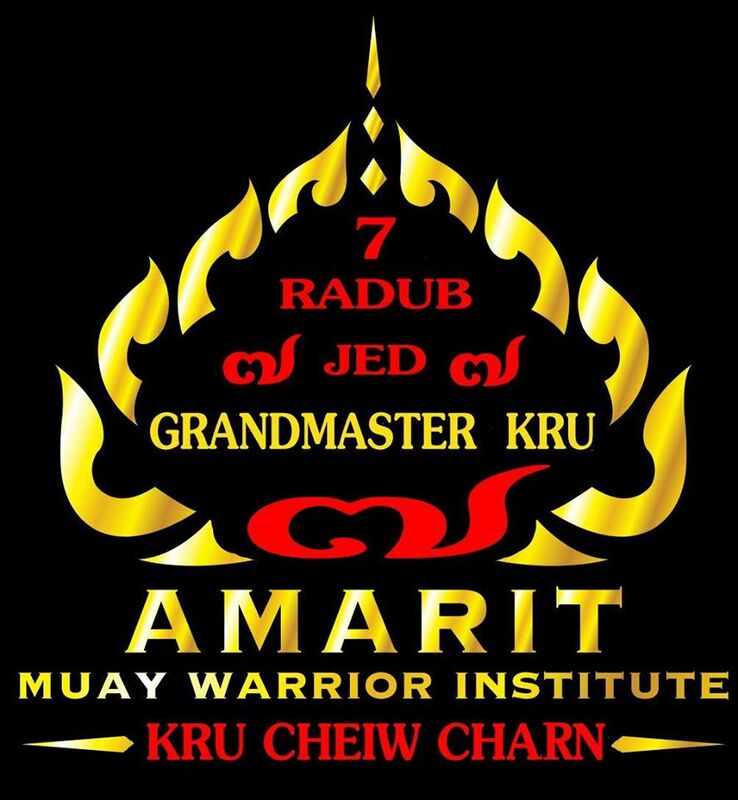 The I.A.M.T.F with the Office of the National Culture Commission have re-introduced the Official Wai Kru Ceremony for both Muay Thai & Krabi Krabong after years of it being neglected. 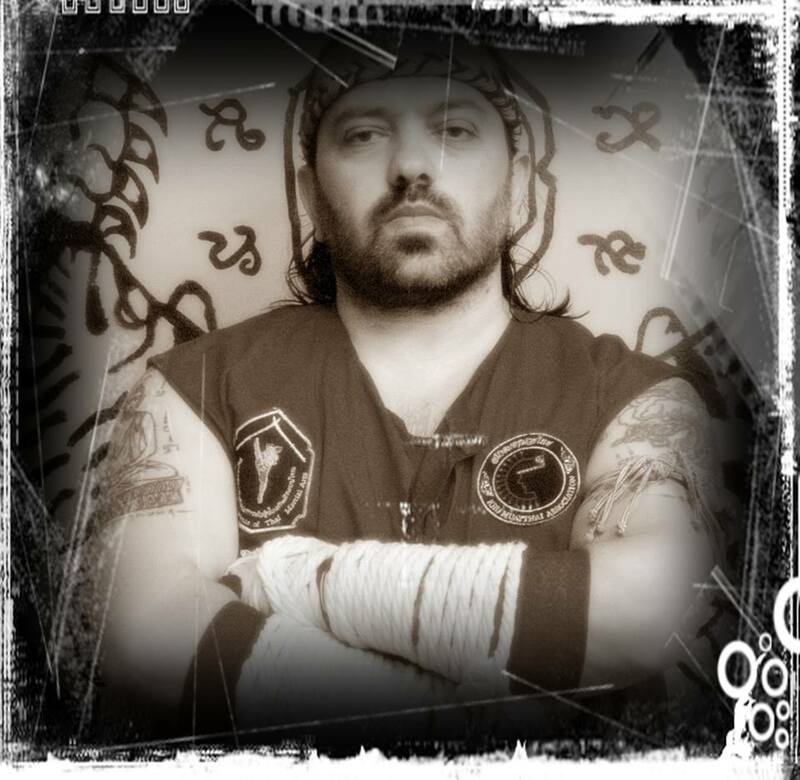 This neglect came about because of the fragmentation of Muay Thai Groups around the World, many of which did not completely understand the correct procedure to follow and the true meaning of Wai Kru. 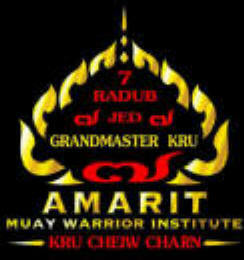 For, without the Wai Kru Muay Thai would not be the same, and would lack one of the most essential aspects of the Art! The very first Official Wai Kru Ceremony was held in the Janyingyong Gym at the National Stadium in Bangkok during 1994. President of this auspicious Ceremony was General Prem Tinsulanon, a Member of the King's Privy Council and also a Senior Statesman of Thailand. He was so impressed with this, that he suggested that it should be preserved and organised the same way every year for posterity, for the benefit of all peoples from around the World, who are interested in Traditional Thai Culture & Arts. The I.A.M.T.F and the Office of the National Culture Commission have now made all the arrangements for this to happen henceforth. 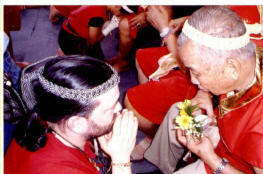 The Thais always hold Wai Kru ceremonies on a Thursday, which is believed to be the Teacher's day. On that day, pupils present certain offerings, usually flowers, money, cloth, etc to the person who has accepted them as his student. The pupils make a vow that they will study seriously and patiently, respect him and behave fairly to their fellow students and will use the knowledge gained properly, and so on (see the following copy on the next section). One of Thailand’s special Customs is the 'Wai', it is used on a number of different occasions. Such as - a greeting when meeting people like other Muay Thai practitioners or students, people you train with or Thai people. It can also be used as a way to say farewell or good bye to them. This is also done by saying - Sawasdee Krab (with your palms joined & placed in a position lightly between the chest & fore head, head bowed slightly). Besides that, the Wai can be used to apologize or to say sorry, by also saying Khotode. 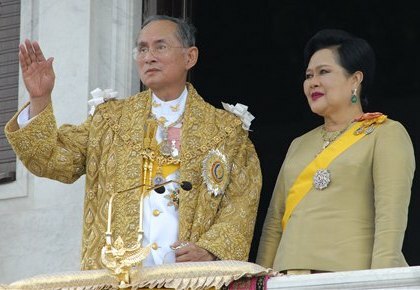 In Thailand (and other places where its people have moved to) it is a significant Social Custom which reinforces both the Social structure and religious dogma. It is a statement of a persons rank in the Social hierarchy. Who 'Wais' whom first & exactly how, are all part of the dictates of the way to Wai. For instance, generally speaking, a younger person Wais an older person first, a Social inferior Wais a superior first. A monk will never Wai a layman. It is very important, that all Kru MuayThai should remember to stress the importance of the Wai to their trainees during Muay Thai Classes. Any trainees who may seem to forget this Traditional Custom should be firmly reminded of it !! Furthermore, Kru MuayThai should try to set a good example to their trainees in this at all times, and whenever it is possible. 'Kru' is a Thai word which means the person who teaches 'sid', or passes on knowledge to pupils (sid). Normally Krus are highly respected in Thai Society. They are knowledge able, full of perseverance. They practice high moral standards in their way of life, leading very respectable lives. They always devote themselves to performing their teaching commitment until their pupils attain full knowledge and are successful in their fields. Such a Kru is usually rewarded by his sense of achievement, respect from everyone and an increase in the number of students willing to submit to his guidance. To show sincere appreciation and perseverance, dedication and generosity in conferring knowledge & providing experience for good opportunities, pupils in return will submit themselves obediently and respectfully to their own Teacher's instruction and advice, serve him diligently, and obey the rules and regulations laid down by him (or her), so that the Teacher can pass on the knowledge of that particular field to them closely, quickly, properly and wisely. Wai Kru is a demonstration of the pupil's respect & gratitude to his teacher in submission to the teaching & training. Wai Kru is traditionally practiced by Thais of various professions & Arts, e.g dancers, sword fighters, musicians, as well as academic students, and of course Muay Thai Boxers are no exception. As we have previously stated, "Wai" means to pay respect by putting both hands together in front of the chest. The demonstration of Wai Kru does not only imply paying respect to the present Teacher, but also includes homage to all the teachers of the discipline. 'I swear by this Oath to become their student and sincerely promise to abide by the Rules and Regulations, and give fidelity to my own Teacher. I will conscientiously try to preserve all the knowledge, skills and all the Traditional Rules and Practices which I shall learn'. 'In addition, once I have been trained by my Master, I will preserve the right to take the - pattern learned as my own. I sincerely promise not to be disrespectful to, insult, treat with contempt, nor take revenge on my Master, or students of my Master'. In Muay Thai, the boxer will always preface the fight with Wai Kru and this tradition is still practiced nowadays. This ceremony is usually performed to rousing Thai music from pipes and drums, and with the initial Ram Muay (the boxing movement). The Wai Kru & Ram Muay are useful, since the Boxer gains encouragement from paying homage to his Teachers and feels that he is not on his own: he has his Teacher & the other Teachers of the Muay Thai discipline to support him. The Wai Kru process will also give him time to concentrate & revise what he has learned, as well as display the nature of his weapons and the high degree of his skill. The steps, movements & use of his weapons are designed to warm up the body's muscles, survey the field of play & conceal the contestant's style of fighting. When the traditional Sarama music sounds around the ring it is recognized by all who are present as a symbol of deference & respect. Prior to the fight, the music helps to urge the fighter on, and rouses his spirit until he is ready to face his opponent in the boxing ring in manly combat. The accompanying photograph shows a number of the Mongkons placed in a ceremonial vessel ready for the presentation ceremony, with other special objects. The Mongkon (Mangala) is the traditional Thai head band which is worn by Muay Thai exponents while paying respect to their teachers and carrying out the ritual dance prior to the contest. It is usually made from a special cotton yarn which has been bound together in a certain way. The Mongkon is a sacred object which a Master of Muay Thai has previously ceremoniously blessed at a special Teachers Homage Ceremony and can contain Sacred Buddhist items such as a picture and inscriptions. In the past (and sometimes at the present time) they have had a sacred amulet wrapped in them which a monk has said special prayers for. Ancient warriors & fighters used to wear the Mongkons before any bout of combat because they believed it would bring them good luck and enable them to win the fight. This tradition has carried on through, right up to the present time. We as Muay Thai Teachers or Instructors have a duty to our students and Society in general to help teach younger generations all the traditional values so that they can contribute to society themselves, as well as teaching them all the pure techniques of Muay Thai. Because of the chance of mishap or accident during the course of learning the Martial Arts like Muay Thai which is a Contact Sport, there is a need for some guidelines, such as self control, discipline & most of all respect are all essential elements of this. Generally speaking, one should not show anger or irritation, or offer blunt criticism. Anger not only breaks all the Rules about avoidance of conflict, but it also causes considerable, possibly irreparable, loss of face to whoever displays it, Criticism similarly smacks of confrontation. Such discourtesy may be met by studied politeness, but this only disguises the cost. Try to remember to stay calm in the face of frustration & difficulty. The Thai people applaud the quality of - 'Jai Yen' which literally means 'Cool Heart'. Coolness coupled with respect and politeness does not represent weakness to Thais, but it is thought of as appropriate behavior. This is a ceremony performed before a fight to honor one's teacher. The fighter stands in his own corner and prays. 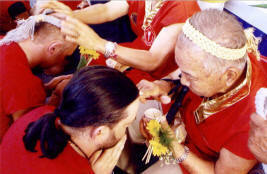 The trainer places the MongKong (ceremonial head-band) around the fighter's head and prays, finally blowing his spirit into the fighter. The fighter goes to the center of the ring and kneels down facing the direction of his home and places their hands in a Wai (praying) position. The fighter thinks of his religion, father & mother, teacher and someone who has passed away. 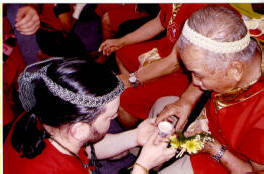 Bow three times in respect, first for country , religion and then for king (ramma) then return to the Wai position. Bend over, opening your hands, and roll your hands down and in a circular motion. "Like an eagle," says Arjarn Vangelis. As your hands come together extended straight in front of you the index fingers and thumbs come together to form a diamond. Then, while maintaining the diamond hand position, swoop your hands into your stomach. Then extend the same structure out and up over your head to a vertical position as you look through the diamond. Finish the motion by bringing your hands straight down and into a kneeling Wai position. Rise to a standing position to perform the Yang Sam Kung (three step dance). Ajarn Vangelis version of this dance is heavily influence by the defensive hand and body mechanics of Krabi-Krabong. Return finally to your own corner to pay respects last in that corner. Muay Thai Orchestra plays music that accompanies both the Wai Kru as well as the actual Muay Thai fight. The musicians play very aggressively to match the pace and intensity of the fighters. This music will make you fight. every October 29th. On this day students are asked to make a ceremonial gift in thanks to their teacher. in respect and thanks to the teacher. is accepted for the first time in Muay Thai training. Some teachers will not make a new student do this ceremony, especially if they are a westerner. But doing this ceremony will make your teacher very happy and put you on a good footing with them as you begin your training. To merit and worship God. If we consider the roots of all different types of art, it can be seen that religion plays a vital and influential role in its direction. Therefore, all different form of art attempts to bring man closer to God (if you do not believe in God then it is quite difficult for you to understand art, especially the art of MUAY THAI and the Wai Kru ritual). Hence, the Wai Kru and its music is to worship all the gods, especially the god Pra Isuan, the creator and the ruler of the universe. 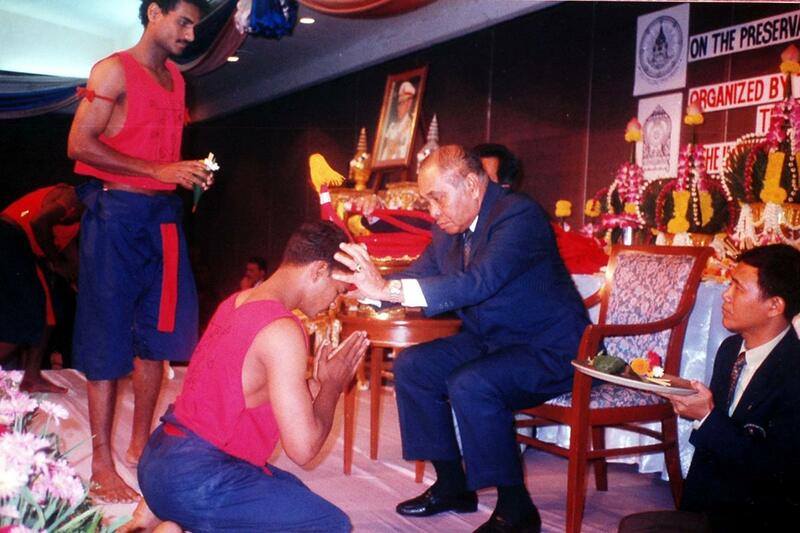 It is then appropriate for MUAY THAI Boxers to invite and accept the holy spirits into their bodies and minds. Heart and Soul. Other than the invitation of the holy spirits, the art of the Wai Kru is to prepare the boxer's heart and soul to another level - the level of divine and supernatural conditions. Physical body and time must be forgotten so as the MUAY THAI Boxers can take on this divine force. The problem that often occurs is whether the boxer can reach this spiritual being or not. It can be achieved, but only if the boxer concentrates during the Wai Kru with true sincerity and respect. But what will happen if we do not perform the Wai Kru? One of two things could occur, firstly the art of MUAY THAI would not exist and secondly the boxers would not fully understand the art of MUAY THAI . Therefore the Wai Kru ceremony is very important. We may not be able to see this auspicious force but the boxer himself can feel the existence of his mentor by his side. The God, Pra l-Suan presented humans with the gift of music and dancing so that people can enjoy true happiness. True happiness without greed and selfishness will induce us to forget our own body and time, Therefore, during the Wai Kru the boxers should let their soul leave the body and let the holy spirit take over. Boxers who practice the kah-tah (religions verse) during the Wai Kru believe that these verses will give them supernatural power. In ancient times, Thai warriors believed in amulets, charms and the occult to possess them in battle as a means of increasing morale. To use these supernatural powers, concentration is the main factor in controlling the fighter's will. The majority of the ancient warriors would put their faith in the god of wars, such as Hua Jai Hanuman, Hua Jai Kun Pan, Hua Jai Kong-Kah Derd, Hua Jai Oran Pet, Hua Jai Pra-Lai Penk and many others, depending on what strength and faith they have in each of the different gods. Today, the "Wai Kru ritual" is known as the "Wai Kru" for short. 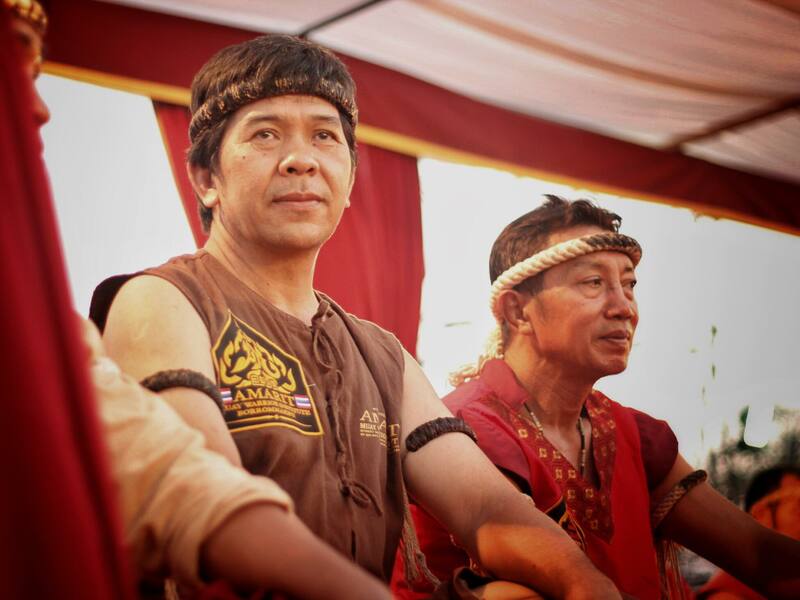 In MUAY THAI competition, the art of the Wai Kru ritual is of a basic one. It is conducted to pay respect to the instructors, the opponent and the spectators. In reality the effectiveness of the ceremony is to demonstrate the gentleness and graciousness in the controlling of the body and the mind. Boxers should "Wai Kru" in the way it has been done by our ancestors in the past. It is a way to help preserve the art of MUAY THAI from disappearing or from losing its authenticity. The first thing a boxer learns in MUAY THAI is the Wai Kru. The Wai Kru is not designed to insult or show off to the opponent. It is a ritual in memory and in respect of the mentor who have given the boxer his knowledge and skill. Other than that, the Wai Kru makes the boxer concentrate on his MUAY THAI skill while practicing his balance. Submission as a student, Keun Kru or Yok Kru. Keun Kru or Yok Kru is when the instructor accepts the student and the student accepts the instructor to be the one to train him. In the past, the student must serve the instructor for a period of time before actual training begins. During this period the instructor will study the student to ensure that the student is trustworthy, honest and able. Once the instructor is satisfied with the student's performance permission is given by the instructor to conduct the Keun Kru ceremony, in some areas it is called the Yok Kru ceremony. This ceremony is where both the instructor and the student accept one another and the student must abide by the rules and regulations set forth by the instructor. The Keun Kru ceremony is conducted on Thursday because in ancient times, Thursdays are considered to be an auspicious day for such occasions. The student must bring along some personal items for the ceremony. As for money, it depends on each individual instructor. The ceremony is conducted in front of a Buddha image and the student will pledge his loyalty to the instructor. Kronb Kru. 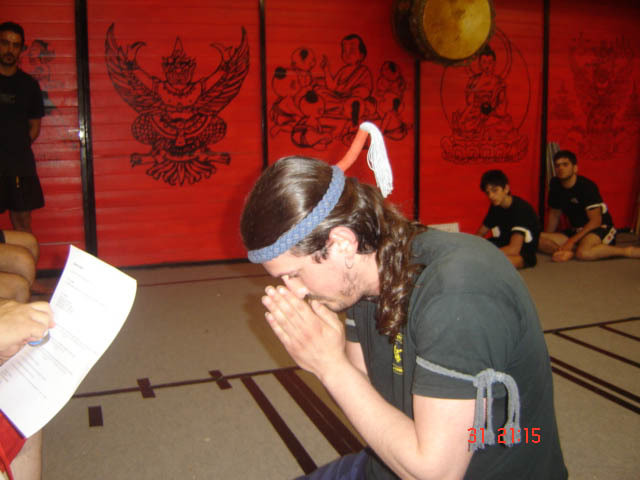 Kronb Kru is a ceremony conducted for the student on the completion of his training. The student has now the ability to transfer his knowledge and skill to others and at the same time, be able to adapt and apply his skill to suit the situation. The student is ready to compete in any competition with pride. In this ceremony the student is given the Monsol according to the tradition of that training camp. Again, this ceremony is conducted on a Thursday before noon at the home of the instructor or at the temple. Yearly Wai Kru. "Yearly Wai Kru" is a tradition that Thailand has carried forth since ancient time. We Wai Kru to respect our mentors because if it was not for them we would not have the knowledge and principles that we abide by. It is these two virtues that enable us to carry on fulfilling our tasks. In this ceremony we again pledge our respect and memories to our teachers past and present. Even though some of us have long finished our education or training we still give our teachers the greatest of respect. The day chosen for the Wai Kru is Thursday as it is believed to be 'the day of the teachers'. The Wai Kru. The art of MUAY THAI from past to present has a tradition that every tighter must perform the Wai Kru before every competition. Wai Kru is performed as a means of paying respect to the chairperson of the competition or in the past as a way to pay homage to the King who would normally be a spectator on almost every occasion. It also symbolizes the gratefulness of the fighter towards his mentor who had trained him and as a means of concentrating himself mentally for the competition. If we further study the roots of the Thai culture we will discover that the Wai Kru is not just a way of paying respect to only our mentor but what this ritual is actually doing is paying homage to mentors before and long before him since the dawn of humanity. Hence, the Wai Kru is a way of worshipping past instructors and the way up to the holy spirits in heaven. Music is an integral part of MUAY THAI and because of it, this art of self defense has become an extension of one of Thailand's dramatic arts. According to legendary chronicles and historical records of Thailand, MUAY THAI competitions were customarily organized on celebratory and festive occasions. It was also used as a means of selecting men with great fighting skills to serve in important positions in the military. The most important question today is how are we to preserve this beautiful and gracious art from disappearing or from losing its authenticity? There are many ways to answer this question, but first of all we must fully understand the importance of the WAI KRU ceremony. To train for MUAY THAI a fighter must have a mentor. Perhaps a fighter will be directly taught by other fighters, but all in all, every fighter is considered to have a mentor, and it is customary that all fighters must respect their mentors. One of the most important virtues of the Thai people is the showing of true respect and sincere humbleness towards teachers, masters, mentors and instructors. They are considered to be second from their true parents. Instructors are full of knowledge, love and kindness, ready and willing to transfer their skill and knowledge to the students, so that the students in turn will be of value to society and to the country as a whole in the future. The opportunity to be endowed with all their knowledge and skills. The ability to use the knowledge learnt to benefit himself and others. Life of prosperity, those students who truly respect their mentors, are consistent in behavior and humble will always be looked after and taught, giving the student less chance of doing wrong as the students will always think before actually doing anything. The ability to adapt and advance the knowledge and skill that the student had been trained for to further heights.